The Bell tradition of leading the helmet industry in innovation and superior engineering continues with the Bell BR.1 Snell SA2015 rated auto racing helmet. 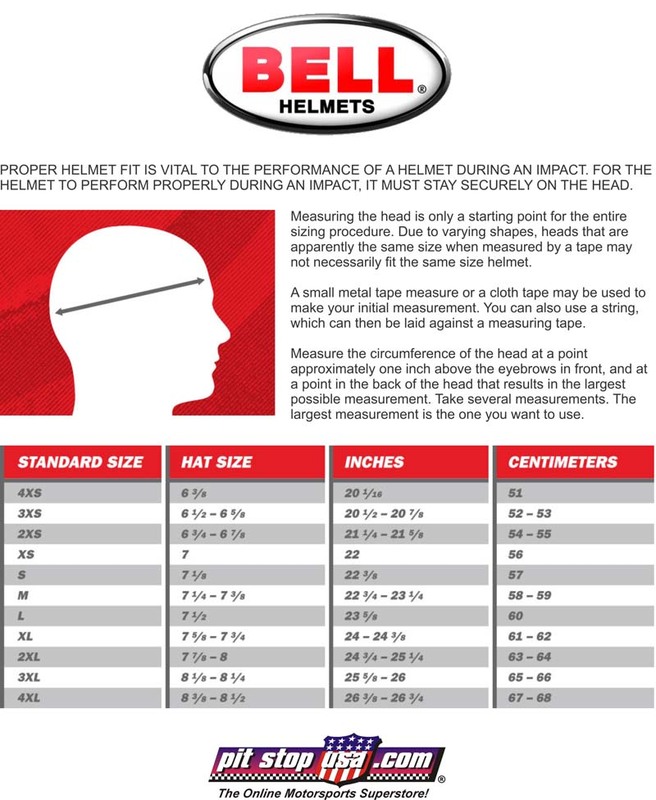 The Bell BR.1 Helmet is the first model in the industry that can be used as a traditional helmet, side air forced air or top air forced air model. Measuring the head is only a starting point for the entire sizing procedure. Due to varying shapes, heads that are apparently the same size when measured by a tape may not necessarily fit the same size helmet. A small metal tape measure or a cloth tape may be used to make your initial measurement. You can also use a string, which can then be laid against a measuring tape. Measure the circumference of the head at a point approximately one inch above the eyebrows in front, and at a point in the back of the head that results in the largest possible measurement. Take several measurements. The largest measurement is the one you want to use. By utilizing an innovative kit system, racers can now customize the Bell BR.1 auto racing helmet to adapt to different forms of racing or seat configurations. The Bell BR.1 helmet features an aero front chin gurney (duckbill) and comes standard with rear facing Venturi airflow vents installed for dirt track forms of racing. The Top Air and Side Air kits are sold separately with multiple nozzle options. Pit Stop USA offers Bell BR.1 Snell SA2015 rated auto racing helmet at low everyday prices. Be sure to check out all our products from Bell Helmets including Bell Racer Series Snell SA2015 Full Face Auto Racing Helmets.